Kuala Lumpur Fashion Week ready to wear celebrates its fifth anniversary at Pavilion Bukit Bintang with five highly anticipated days of fashion exhilaration. From 16 Aug to 20 Aug 2017, KLFW RTW 2017's models will be strutting down the runway with an exciting mix of local and international designer's never seen before "Runway Collection" exclusively at Kuala Lumpur Fashion Week Ready to Wear from the 16th to 20th August 2017. We have put together a list of things that you need to know about the upcoming Kuala Lumpur Fashion Week 2017 ! Kuala Lumpur Fashion Week Ready To Wear 2016 will be held from 17 - 21 August 2016 at Pavilion Kuala Lumpur. KLFW RTW 2017 will collaborate with Amazon Fashion Week TOKYO and will be inviting ONE Malaysian designer to showcase in Amazon Fashion Week TOKYO 2018. Dato’ Farah Khan (http://farahkhan.com/brand-dna/) is the founder and president of Malaysia’s leading luxury retailer, The Melium Group, and creative director of her eponymous label, Farah Khan. Farah Khan will be presenting her exclusive Runway collection for KLFW RTW 2017 in conjunction with her 10th Year Anniversary. There will be more than 150 designers showcasing their Runway Collection throughout the 5 days. And below is the KLFWRTW2017 Designers Line-Up. 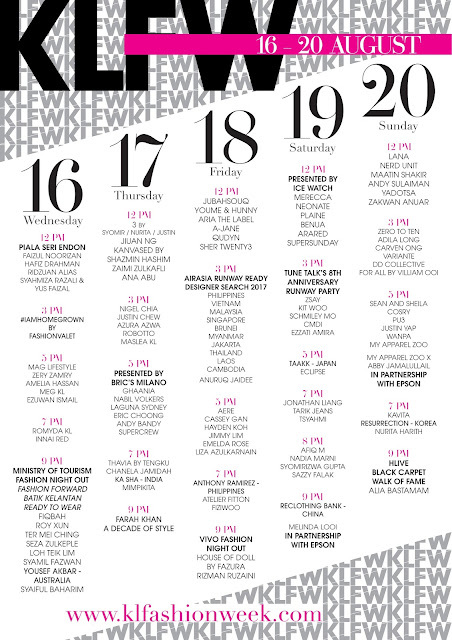 If you want to keep yourself posted with the latest for Kuala Lumpur Fashion, here's their official hashtag #KLFWRTW2017. To show that Tourism Malaysia is as fashionable as the KLFW, Tourism Malaysia has created a Fashion-On-Go OOTD Truck. This initiative is to encourage public join in the fun, All you need to do is to take an OOTD picture and upload it on social media with the official hash tags #RURunwayReady, #Negaraku, #SayangMalaysia and #IAMHOMEGROWN; Lucky winners will stand a chance to win tickets to KLFW 2017.